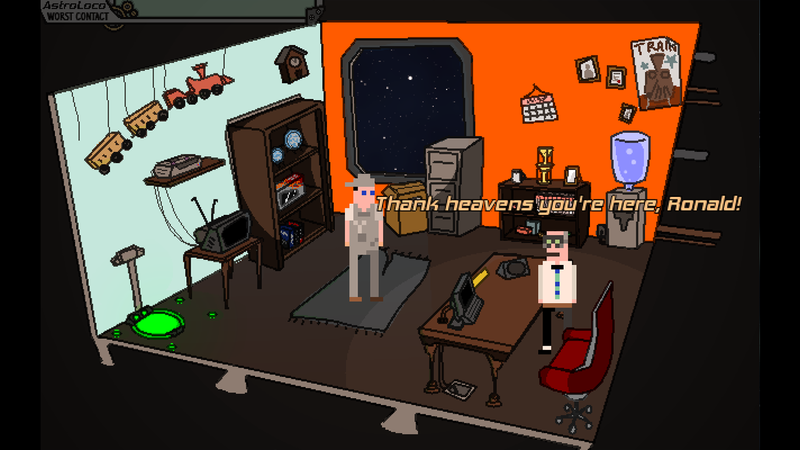 Astroloco: Worst Contact is a hilarious indie point-and-click adventure from Hungry Planet Games. Inspired by genre classics such as Space Quest, Monkey Island, and Day of the Tentacle, you can tell it was a labor of love for the creators. 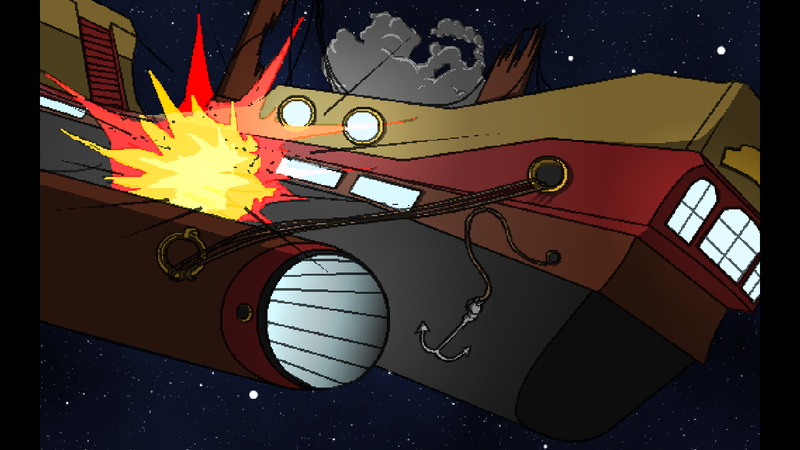 The year is 2153, and humans are using giant train-spaceships to colonize the galaxy: Astro Locomotives. Due to a scheming bad guy (complete with cape, top hat, and Snidely Whiplash mustache) and an unfortunate miscommunication with aliens, Ronald and Arianne need to save the universe from certain destruction! The game was created in the popular Adventure Game Studio. The backgrounds are hand-drawn and much more detailed than the characters, who are 8-bit and pixelated. The overall effect is really charming, however, and I really liked looking at the game. The music is fun and never obtrusive or repetitive, at times even meshing with what your characters are doing, and the end credits theme is particularly beautiful. Voice-acting is all-around excellent, with enough variation that I thought they had way more voice talent contributing than they actually did. No one person stands out, but I did love how bombastic the narrator was – he definitely sounded like he was narrating an old radio program or 50s TV show. Ronald, the person you spend the most time with, sounds a lot like Richard Dreyfuss – I’m not sure if this was intentional or that the voice actor also happens to sound a lot like Richard Dreyfuss. Something I found odd was that Ronald is the only non-British character – he uses a few Britishisms as well, which does make sense if he’s around British people all the time. I found myself wondering how he ended up on an all-British station! There is an excellent developers’ commentary as well, which is utilized in the same node-based way that games like Portal use. 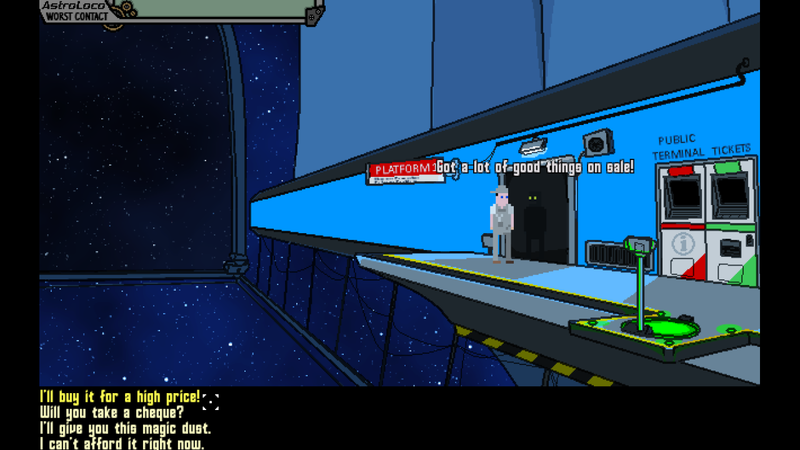 Astroloco‘s controls are extremely simple and intuitive (left click look/move, right click interact), and even if you’ve never played an adventure game before, there’s a hilariously self-aware tutorial. You can save and load at any time, and the game even autosaves after important events, which is a nice touch for an adventure game. Another appreciated feature was being able to use the fast-travel PORT system instead of traipsing all over Gilbert Station. You get to switch between two characters as you play the game – Ronald, a space janitor (which is a nod to Space Quest) and Arianne, a hotshot pilot who doesn’t always think before she shoots. Both characters have their own missions in act two, and you can switch between them at any time in order to complete them. Ronald’s is getting Gilbert Station up to par in order to fight the aliens, and Arianne needs to find fuel to get off of a planet. 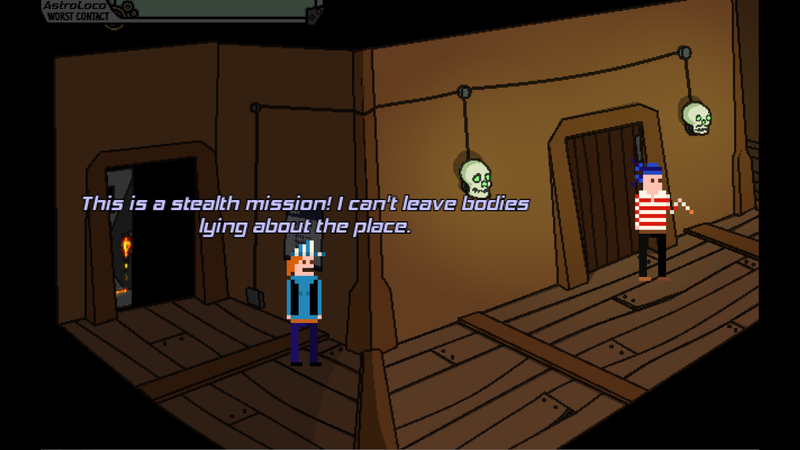 Something that has been streamlined from typical adventure games is the inventory system. Ronald has a wrench, a screwdriver, and a hammer at his disposal, and Arianne has her laser pistol. If a character picks something up, you never see it again – they handle their own inventory and will use objects they have when appropriate, so you don’t have to play the inventory-combining shuffle that is practically a mini-game in almost every other adventure game. This game is really, REALLY funny. It’s a great combination of British humor and self-referential material. If you’ve played a lot of older adventure games (especially the Monkey Island series, which I found a ton of references to), you’ll get more out of the humor than if you haven’t. However, I think it would stand on its own even if you were a complete newcomer to the genre. I also found references to Portal, Fallout, Star Wars, and even Jurassic Park! The game is also very aware that it is a game, making digs at the conventions of adventure games and video games in general. I love when anything breaks the fourth wall, and this game definitely knew it was a game. Probably the only complaint I have about Astroloco is the length. It only took me about two and a half, maybe three, hours to complete, and that was without a walkthrough (you shouldn’t need one, by the way – all the puzzles are extremely intuitive). It also ends really abruptly – I thought there would be a longer third act. There is a small scene after the credits, however. Despite the game’s shortness, the low price (less than a movie ticket! ), great writing, and amazing humor make it worth it. Plus, space trains…come on. I’ll be looking forward to more offerings from Hungry Planet Games. You can get Astroloco: Worst Contact on Fireflower Games for €4.99, and on GetGames, Desura, and Amazon for $5.99. It is coming to Green Man Gaming soon, and you can also vote for it on Steam Greenlight. You can download the demo on the official site. Find Hungry Planet Games on Facebook, Twitter, and YouTube. Sidenote: When you get the game, you also get two games by the company that were produced for Ludum Dare Jam, subAtomic and Plan M, both of which won in the humor category. I can say as a fact that Ralph (the ships computer) is also a non-british character.